It’s hard to believe when you are tipping your bike into a bend with the merest fingertip pressure on a bar, that your bike weighs a couple of hundred kilos. But when you’ve got to push it into the garage past the car and the kids’ bikes that weight is all too apparent. 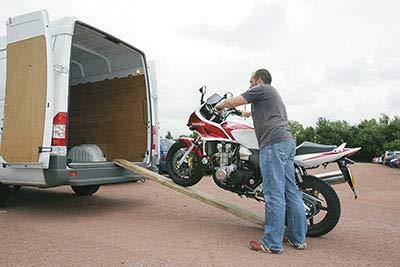 The key to moving your bike at walking speed is the same as at 60mph plus, planning and position.